A London hotel bar has launched a new interactive ‘Whisky Nosing and Tasting Experience’, which includes a chocolate and Scotch whisky pairing menu. Available from the Terrace Bar at the Chesterfield Mayfair hotel, the Whisky Nosing and Tasting Experience is open to both hotel guests and visitors, and comprises three different menus. 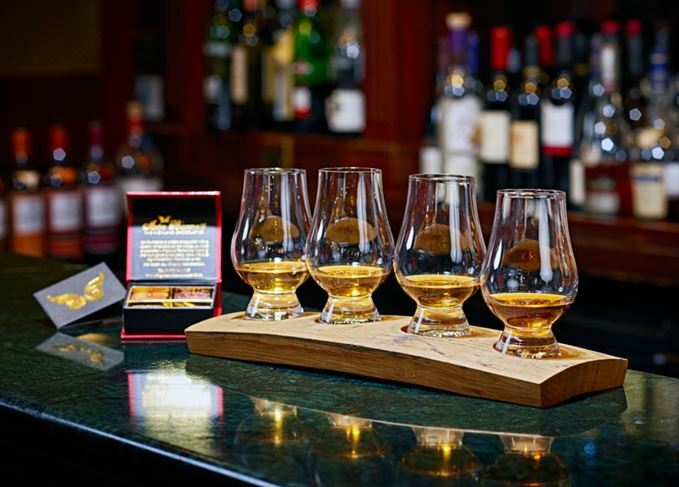 Each experience features four 15ml measures of whisky, served on a wooden tasting tray made from whisky barrels. Prices start at £25 per person for the ‘Around the World’ experience, which includes Knob Creek Bourbon, Glenrothes Scotch whisky, Crown Royal Canadian whisky and Yamazaki 12 Year Old from Japan. Alternatively, patrons can nose and taste their way through the ‘Scottish Adventure’ flight, priced at £30 per person, which showcases whiskies from different Scottish regions, including Auchentoshan Three Wood, Highland Park 18 Year Old, Oban 14 Year Old and Lagavulin. A ‘Macallan and Chocolate Pairing’ is also available to sample for £45 per person, featuring Macallan Gold, Macallan Amber, Macallan Sienna and Macallan Rare Cask. The launch of the whisky experience menu coincides with the bar’s unveiling of seven new molecular cocktails. The Macallan and Highland Park owner will relocate to 100 Queen Street in spring 2017. More than 100 rare whisky lots are on offer in the Hong Kong sale, worth a total of up to HK$2.5m. Taking it easy with Highland Park Magnus, Dewar’s 25, Balvenie Peat Week and The Art of Whisky. Smoke is the overriding theme as our magazine editor picks his three stand-out whiskies of 2016.